Export Outlook contacts with CoolUtils tool! You are here: CoolUtils > PDF SplitterX > Export Outlook contacts with CoolUtils tool! PDFSplitterX is an SDK/COM tool for integrating PDF splitting features to a custom system. You can seamlessly build-in its features into your own interface as we provide sample codes for all popular programming languages (ASP, C++, C#, and PHP). 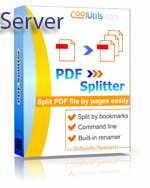 PDF SplitterX is commonly used for server-side splitting of PDFs along with some additional options. While other PDF splitters just split multi-page PDF files, our program can also detect and delete blank pages, give new descriptive names, add pagination, set user permissions or sign output file with a digital signature. Splitting by blank pages is also available. When users scan papers to PDF, blank pages sometimes get in PDF files. You can split multi-page PDF in server removing those unnecessary blank pages. Another option is dividing original PDF file into parts by specific number of pages. For instance, the script can create a separate document for every 5 pages of the original PDF. This server-based PDF splitter processes documents in batch and can queue service requests from different users. When splitting PDFs to pages or bigger parts it is always a problem of proper naming. In PDFSplitterX there is a parameter for file name template. Original file name, the number of page contained inside and other parameters can be in a file name template. All these options are managed seamlessly via command line. It is possible to use it as a local server-client application, wrap into a custom interface or create an online app. This PDF split SDK is provided with samples for using it in ASP, C++, C# and PHP projects. Get it here!